Google sees a ‘new direction’ for its social network after a security flaw prompts it to kill off the consumer version. Google Plus is being tied more tightly into G Suite. Google will aim Google Plus solely at enterprise users as it shuts down consumer access to its ailing social network over the next few months. Google announced plans to discontinue Google Plus last week, following reports of a security flaw that exposed user data to third-party developers. The bug was discovered and patched by the company in March as part of an internal audit of privacy controls, dubbed Project Strobe. But the breach was not made public until recently. Google launched 'Plus' in 2011 as a competitor to Facebook, but failed to gain significant traction in trying to displace its rival. Despite having 395 million monthly active users, actual time spent with Plus remains low; Google said that 90% of user sessions last less than five seconds. Consumer access to Google Plus is slated to end in August 2019. At the company’s Cloud Next event in London last week, the company unveiled new business-focused features as part of the “new direction” for Google Plus, and cited Nielsen and French retailer Auchan as large organizations already using the application to connect thousands of employees. New features include the ability for G Suite admins to moderate and review employee posts, which builds on other recent additions such as a dashboard for community engagement metrics. Admins will also be able to define custom streams that contain communications related to a particular subject. 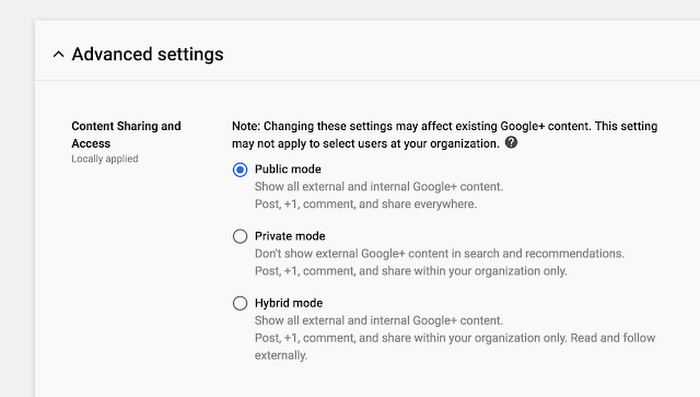 G Suite admins will have more control to moderate and review employee posts in Google Plus. In addition, message tags should make it easier for workers to share information with the right colleagues, Google said, with draft posts and the ability to see suggested tags. The goal is to help employees keep track of discussion topics that are relevant to their role. The new features will roll out in 2019. “With this new Google Plus experience, G Suite customers can create a stronger connective tissue across large organizations,” said David Conway, product manager, in a blog post. Google’s announcement should be seen as a starting point, analysts said. “It’s good to see Google talk about enterprise social networks more seriously, but these features appear to be incremental,” said Larry Cannell, a research director at Gartner. As an enterprise social network, Google Plus faces competition from established tools such as Microsoft Yammer, Jive and Facebook's Workplace, which recently bolstered support for collaboration between multi-company groups. Google’s repositioning of Google Plus comes as more businesses embrace the team chat tools that have emerged in recent years, such as Slack and Microsoft Teams. Google has its own take, Hangouts Chat, which started life within Google Plus. These workstream collaboration tools promise to aid more effective communication and collaboration between colleagues, and deliver higher adoption rates than past iterations of social networks.